Do you want Harry to keep Brum up? Yes - I wish him and Birminhgam well. No - I hope they both fail. Meh - Don't give a monkeys either way. Re: Do you want Harry to keep Brum up? He did a job, got us promoted and created one of the few big time memories we have as QPR supporters. I'm thankfull for that and he has my respect. All the best to him. I think you'll find that was despite him, not because of him, and... just to be clear it was a decent atmosphere alright but a fearful tension and apprehension wasn't far from the minds of those 40,000+ and the memories only began with Junior Hoilett putting Buxton on his arse before passing to Keogh who lined it up for Bobby in the 89th minute. The hours afterwards were a different kettle of fish altogether but there was very little that Harry had to do with it. Harry on Talksport this morning said he has Ravel Morrison on trial - apparently his last change and he has been advised he has to deliver on the pitch! Ravel is easily lead and been poorly advised in the past! He'll probably have one good game - against us. Potentially, a little more serious than a dodgy knee. Bet it works at Brum. 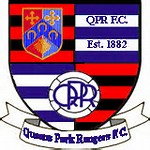 Can't go by our experience, as very little ever works out well where QPR are concerned. Let's hope now we have zero funds and expectations... we can buck the trend.